Bison is one of the most nutrient rich meats and is naturally low in cholesterol. Its levels of iron and protein make bison a perfect beef substitute. 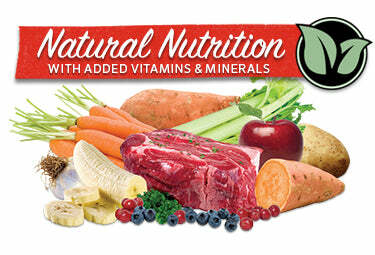 Bison, Potatoes, Flax, Sweet Potatoes, Carrots, Celery, Apples, Bananas, Blueberries, Cranberries, Pumpkin, Garlic, Vitamin A Supplement, Vitamin D3 Supplement, Vitamin E Supplement, Niacin Supplement, Iron Proteinate, Calcium Carbonate, Phosphorous, Zinc Proteinate, Riboflavin Supplement, Thiamine Mononitrate, Potassium Chloride, Manganese Proteinate, Copper Proteinate, Magnesium Chloride, Pyridoxine Hydrochloride, Vitamin B12 Supplement. Grandma Lucy’s Artisan Bison Recipe is formulated to meet the nutritional levels established by the AAFCO Dog Food Nutrient Profiles for All Life Stages. We started as many of you, concerned pet parents. At the time, Lucy our English Cocker Spaniel, was 11 years old and becoming extremely picky about what she would eat. We tried most treats on the market looking for one that was not only safe and healthy, but one that Lucy would eat. After little or no success, we began reading about what was in pet food and treats. We were surprised to find the inferior ingredients that are typically used in pet food products. As a result of these findings we began to home cook Lucy’s meals and treats. She deserved the highest quality ingredients. The next step seemed natural; we wanted to be able to share with others the healthy and safe treats we were cooking for Lucy. Our ingredients and philosophy have not changed since we began in 1999. We remain committed to using whole food ingredients from trusted suppliers. Grandma Lucy’s provides you with pet food and treats you can trust and feel comfortable feeding to your pets because we are just like you, concerned and loving parents. We thank everyone for their support over the years and promise to continue to bring you only the best!